‘ENJOY THIS TIME OF SELF DISCOVERY’ – as that is what we are experiencing. So much flux ‘above’ and ‘below’, of the past, present and future, of the masculine and feminine of the Divine. We are ‘needing’ to ‘pull back’ and to ‘come back to’ our Divinity within and CLAIM OUR SOVEREIGNTY – with all else that is occurring around us personally and then globally. One can get very ‘lost’ confused or overwhelmed, with all that is occurring, as many of us Empaths feel so very much and so deeply. As we are discovering ourselves through our New Birthing we are currently experiencing, that we can be ‘open’ to outside energies, or the ‘world’ energies – without even realizing! Quite often we ‘reflect’ to others and others to us, to assist us to ‘find’ ourselves. This too is an ‘automatic thing’ that as human beings, we just ‘do’ and maybe again, without realizing. This is a very ‘normal’ part of ascension and growth to do so. How else can we ‘find’ or ‘see’ for ourselves where we are ‘at’ in the world and within ourselves. This is a very ‘brave’ thing to do! There may be those who read this and do not agree, on ‘face value’ of reading this. This is coming from a bigger bigger picture, as this comes from a space of those who are growing into their empowerment and can ‘feel’ they have a ‘calling’ with humanity in their Souls Divine Journeys. (If one does not ‘agree’ with this, that is very okay as I send you much unconditional love, truth and honesty, as I continue to share here as I AM). With so much ‘going on’ energetically and so many at different stages, spaces (yet finding commonality with others within this), the information that is being shared so widely now, can confuse or overwhelm us. And while we may be making progress in our lives, spiritually conscious, we may also feel ‘what do I do from here’ as well. When one finds themselves at this ‘point’, please find ‘comfort’ in the following reading that came for those who do so, at this time. Please realise this is a ‘time’ of SELF DISCOVERY OVERALL…and to ‘know this’ allows us to shift what ever we are feeling, to EMBRACING this. 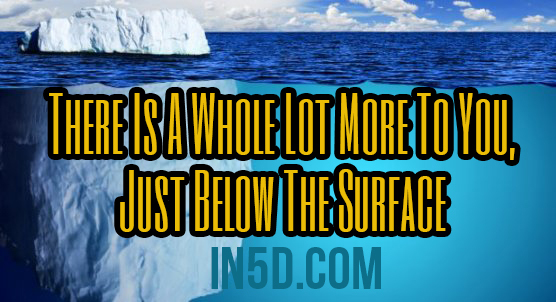 And to ‘know’ that ‘There is a whole lot more to you, just below the surface’! There are aspects of yourself which you are not fully conscious of yet. EMBRACE and ENJOY THIS TIME OF SELF DISCOVERY. As – ‘Sometimes we resist or procrastinate doing the very things that will help to move us along our path. Look at whatever resistance you may have, and gently push yourself forward to do what needs to be done. The stagnant energy that is being held through your resistance needs to be released and cleared. This will help to aid in the flow of new energy, healing, empowerment and manifestation in your life. It is easy to feel as though you are not being heard at times, mainly because the communication feels as though it is only one way. Talking with Spirit is a powerful way to feel supported, connected, and cared for. Especially when we are feeling alone in our physical world. Every time you allow the expression of your soul, it is a cause for celebration! There is a whole lot more to you, just below the surface. These are aspects of yourself which you are not fully conscious of yet. These hidden qualities are about to rise to the surface. ‘Life’s great synchronicities and the alignment of fateful events is very dependent on our contact and connections with other people. You have drawn this card today because it is important for you to make contact with someone in particular in your life. This one-on-one communication could be by phone, email, text message, or in-person. In whatever way way that contact happens, it is important that you reach out. Sometimes we resist or procrastinate doing the very things that will help to move us along our path. The contact card is asking that you look at whatever resistance you may have, and gently push yourself forward to do what needs to be done. Perhaps you need to contact someone and deal with an emotional issue you would rather avoid. Maybe you have neglected speaking with a family member, loved one, or friend. Do you need to get past your fear of making a business call? Spirit is asking that you be brave and make contact with a certain individual. The stagnant energy that is being held through your resistance needs to be released and cleared. This will help to aid in the flow of new energy, healing, empowerment and manifestation in your life. Energetically, you will be free to set-up and align the next step of your journey. This card can also indicate that there is a very important person coming along in your life, with whom you are about to connect. Be present within yourself when meeting anyone new over the next week or two. Be mindful of the energy surrounding anyone you connect with-especially if it is unexpected or synchronistic, as this person could be playing an important role in your future. You are being heard! Your guides and angles are acknowledging your prayers, thoughts, and communication with them. This is their way of affirming to you that your messages are getting through to them loud and clear. It is easy to feel as though you are not being heard at times, mainly because the communication feels as though it is only one way. This is exactly why the Prayers card has come to you today. Every time you pray or talk to your guide and Angels, you are opening up a direct line of communication with them. Although they cannot answer you in the form of words, they are sending you energetic and intuitive replies. Take time after your prayers to sit quietly. Feel your own energy, and the energy within your room. You will start to find that you are becoming more sensitive to their presence, and may also start to tune into the divine messages they have for you. If you have not been speaking to your guides and Angels, then this card has come to encourage you to do so. Relationships take effort on both sides, and they are wanting to build their relationship with you. Talking with Spirit is a powerful way to feel supported, connected, and cared for. Especially when we are feeling alone in our physical world. Usually when this card appears, it is because you are much more able than most to hear the messages of Spirit. Prayer is a powerful building block in strengthening your intuitive gifts. Begin looking for replies and answers to your prayers in your everyday world as well. Spirit is reaching out to communicate back to you now. Every time we allow ourselves to step out beyond our boundaries or find a way to get past our fears, the entire Universe celebrates. It isn’t easy to let the world see us, and Spirit knows this. But we are here to allow our true expression and to allow the deepest parts of ourselves to rise to the surface – to be seen and shared. The surfacing card comes when we are about to face the challenge of stepping up and out into the world. You could be asked to speak publicly, give a presentation, perform, release a novel, or anything which involves putting yourself out there. Whatever it is that is going to be asked of you will involve shining your soul’s light in some way, for others to see. You might be feeling scared as hell and wanting to run as fast as your legs will carry you. But this is why the Universe has given you this card today. Look carefully at the image. There are hundred of tiny bubbles rising to the surface. Take a moment to energetically feel the colours. There is a lot of joy in there. This is Spirit’s way of reassuring you that this process brings with it much joy and celebration. This is part of your soul, doing what it has come here to do. You just have to get past yourself. The surfacing card can also come if we have been brave and expressed our truth in some way. It comes if we have shared a part of ourselves, our gifts, or talents. Spirit is here to acknowledge you and your bravery. Every time you allow the expression of your soul, it is a cause for celebration!